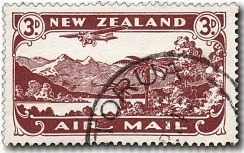 Virtual New Zealand Stamps: Express Delivery & Air Mail 1903 - 1939. Express Delivery & Air Mail 1903 - 1939. Originally our plan was for Anne to tidy up these few issue so Allan and I could work on other projects. Then Anne was given the Chinese New Year posts to do so, since I was between projects, I decided to do this small collection of special issues myself. 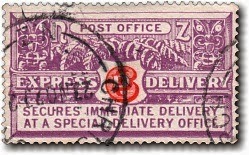 In 1903 and 1939 New Zealand issued a special stamp for a express delivery service. Between 1931 and 1935 a series of stamps were issues for air mail services. 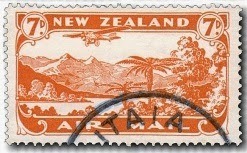 These issues standout from other New Zealand stamps in that they were only used for a single purpose. Normally these two groups would be considered as different sets, in the Campbell Patterson Catalogue they are even assigned separate sections, but since they are both stamps produced for special, faster services, we will be featuring them here as one post. At the beginning of 1901, a delivery service by special messenger was established. Any mail using the service would be delivered by special messenger as soon as the item arrived in the destination office. The 6d fee covered by this stamp was in addition to the regular postage rate. A special stamp based on an American design was issued in 1903 to promote the service which was not compulsory. The design was suitably adapted with the inclusion of Maori carvings and a large black tree fern - Cyathea medullaris. Although it was expected the service (and stamp) would prove popular the initial print run of 117,840 stamps was enough to last for the next 23 years. Later reprints occurring during 1927 - 36. According to the Campbell Patterson Catalogue it is possible to identify these later printings. By 1938 the original stamp had been in use for 35 years and it was thought that the time had come to introduce a new one. 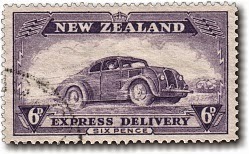 In 1939 a new stamp was designed for express delivery featuring a Chrysler Coupe - which was then in use in the major centres for delivering express mail. The stamp was designed by James Berry and engraved by the Australian Commonwealth Note and Stamp Printer. Of the 240 thousand copies of the stamp printed, over half were printed for collectors after the service was cancelled in December 1941 due to wartime considerations. This explains why the stamp is rarer in used than mint condition. 6d - Chrysler Coupe Car. 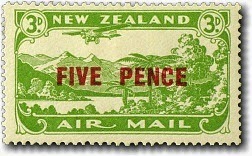 Airmail stamps may have been issued sooner if early postal delivery trials by air within New Zealand had been more successful. However, in 1922 it was concluded that the aircraft in use were unsuited to long distance flights and the trial service was not well patronised by the public. It was overseas developments which eventually prompted the 1931 issue. At the Universal Postal Union Convention in 1929, an international agreement was drawn up where mail that was posted in New Zealand could utilise airmail services in Australia, Canada, North America and the Karachi-London service. 3d - Chocolate Brown. 4d - Purple / Violet. 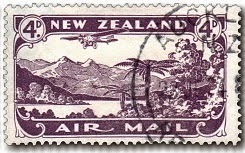 A series of internal airmail flights were planned within New Zealand in December 1931 with a special fee of 3d in addition to the standard 2d postage rate. To make up the combined postage rate, a red surcharge was overprinted on a special printing of the 3d air mail stamp in a new colour. 5d - Overprint on 3d Green. 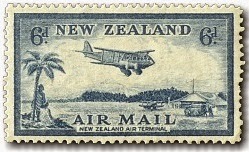 1934 - Trans-Tasman Air Mail. 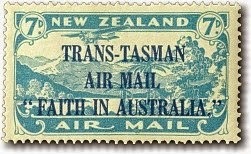 In 1934 the last airmail stamp in the 1931 Airmail design was printed, this time in blue with TRANS-TASMAN AIR MAIL "FAITH IN AUSTRALIA" over-printed on it. This stamp was issued for one month to commemorate C.T.P. Ulm's first official trans-Tasman airmail flight from New Zealand to Australia. Only 83 thousand stamps were issued but many were collected. 7d - Blue Trans-Tasman Overprint. 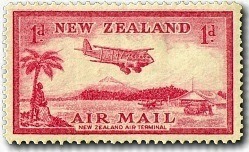 In 1935 a new set of airmail stamps replaced the 1931 designs. James Berry was requested to prepare a new design of an aircraft landing at Bell Block aerodrome, New Plymouth. The design was based on a photograph taken by A H Blennerhasset on 12 April 1934, of the first official air mail from Australia to New Zealand arriving at New Plymouth on the 'Faith in Australia'. The cost of airmail delivery was dropping and at the end of 1934, the first internal airmail services began operating between Hokitika and Okuru in Westland, charging standard postal rates. 1d - Red Air Mail. 3d - Violet Air Mail. 6d - Blue Air Mail. Technical information - 1903 Express Delivery. 11, 14 x 14.5 and 14 x 15. Cowan and Wiggins Teape, NZ and star watermark. Technical information - 1939 Express Delivery. Technical information - 1931 Airmails. Government Printing Office, New Zealand. 14 x 14.5; Some 3d stamps : 14 x 15. Cowan chalk surfaced, NZ and star watermark. Technical information - 1935 Airmails. Some information on this post came from the NZ Post Web Site. 1999 Millennium V - Leading the Way. 1997 / 2009 The Year of the Ox. 150 Posts - Celebrate New Zealand. 1998 / 2010 The Year of the Tiger. Arms Postal Fiscals - Part Three. Arms Postal Fiscals - Part Two. 1998 - Millennium Series II - A New Beginning. 2003 / 2015 The Year of the Sheep. 1941 Cover to the HMS Prince of Wales. 2015 75th Anniversary of Air New Zealand. Arms Postal Fiscals - Part One. Index Eleven - 2015 - 2019. 2014 Baypex National Stamp Show.